After the negative press Medal of Honor has received over its setting and multiplayer, EA is going to let people try it for themselves so that they can put their fears aside. EA is releasing an open beta for Medal of Honor on the PC early next month, in order to clear up any "misunderstandings" that might have arisen from EA's controversial decision to feature the Taliban in the game's multiplayer. Medal of Honor is set in modern day Afghanistan, and EA has come under fire from people all over the world, who say that setting a game in a current conflict - not to mention allowing people to play as the Taliban and shoot US troops in the game's multiplayer - is disrespectful to the people serving in the country, and those who have died there. The anger at the game's setting and content even reached the upper echelons of British politics, as UK secretary of defense Liam Fox urged retailers not to stock the game, calling it "un-British." The two map beta is supposed to allay peoples' concerns and show the "patriotism and respect" that are the core of the game. 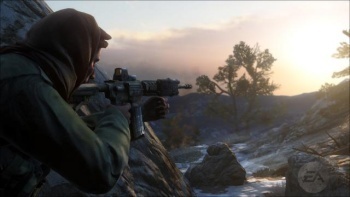 EA Games Boss Frank Gibeau said that the Medal of Honor series had always shown incredible reverence for American and Allied forces, and that the reboot was no exception. This seems to be a slightly different approach than EA's previous responses of "it's just a game," but it might be a little bit more effective, and it's a pretty good way of generating some extra buzz about the game. The beta will run from the October 4th to October 7th, just before the game launches on October 12th.